I just released new versions of my Android applications, as usual available on Google Play or as direct download. These versions introduce a new options menu dialog that can be accessed by swiping up. Hopefully this provides a viable alternative on devices that lack or broke the legacy options menu button. 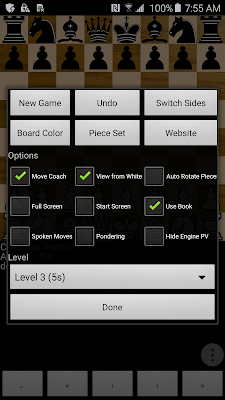 Reversi for Android v2.5.5Checkers for Android v2.6.5Chess for Android v5.1.5 Chess for Android also introduces a slightly cleaner position set up window, and added the ability to define an opening book for an imported UCI or XBoard engine. Please let me know if all works well. In order to ensure my games remain relevant as the old options menu is phased out by some vendors, I am adding new support for action buttons and feature selection. As shown below for the upcoming Reversi for Android update, in addition to the old options menu entered by pressing the menu button, the user can now swipe up to enter a new dialog with action button, check boxes and a drop down box for the levels. I am not just excited about making sure that users can enter this menu again, but also about the fact that this probably makes the features much more discoverable for my users. For Chess for Android, it will look something like this. Expect updates on all my games soon! Working on Chess for Android Again! I am getting excited about adding new features to Chess for Android again! I am in the process of working around the menu button issue on Samsung devices. Furthermore, I am extending UCI engine support with the ability to set a book opening for each engine, as well as allowing a wider variety of number of threads (six in the example below). If you have any urgent feature requests for engine support, this would be the right time to ask. I just released minor updates for my Android applications, as usual available on Google Play or as direct download. These versions allow opening the options menu with a simple "swipe up" gesture over the screen. 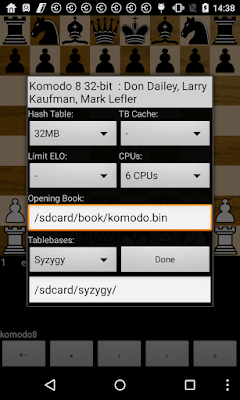 Chess for Android also fixes a problem with importing engines. Reversi v2.5.1Checkers v2.6.3Chess v5.1.2 As some background, my applications still use the older options menu, introduced in the days that Android devices still had a physical menu button. Newer models without a physical button sometimes allow accessing the options menu through a virtual button (shown as vertical dots) or through long-pressing the activity switch button, or sometimes don't provide an easy way at all. This release hopefully makes accessing the options menu easier again.